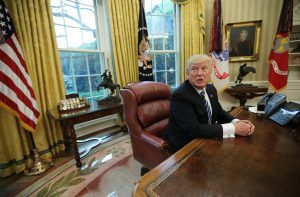 WASHINGTON — President Donald Trump seems destined to serve his 100th day in office without House passage of a major Republican health care bill or enactment of a budget financing the government for the rest of this year. But at least the government probably won’t be shut down — for at least another week. The House won’t vote on a reworked health care overhaul until at least next week, Majority Leader Kevin McCarthy, R-Calif., told reporters late Thursday. Party leaders made that decision after spending all day pressuring moderate GOP lawmakers to back that bill, but fell short of the votes they’d need to prevail. “As soon as we have the votes, we’ll vote on it,” McCarthy said after leaving a nearly two-hour meeting of the House GOP leadership. He ruled out votes on Friday or Saturday — which is Trump’s 100th day in the White House. That was a disappointment for the administration, whose officials had pressured House leaders all week to try completing the health measure by Saturday. McCarthy also said Republicans would push through the House Friday a short-term spending bill keeping the government open for at least another week. They plan to pass it with only GOP votes, if necessary. Minority Democrats are threatening to withhold support unless there is a bipartisan deal on a massive $1 trillion measure funding agencies through Sept. 30, when the current fiscal year ends, and no final agreement has been reached. “We’re working on the funding of government. We’re getting that through” on Friday, McCarthy said of the temporary spending measure. The struggle over both bills was embarrassing to the GOP, which has Trump in the White House and majorities in Congress. Republicans would have preferred to not be laboring to keep agencies functioning or approve a health care overhaul, the gold standard of GOP campaign promises for the past seven years. Senate Majority Leader Mitch McConnell, R-Ky., said bargainers were “very close” to completing the $1 trillion budget package. But underscoring lingering battles over environmental and financial regulations, Senate Minority Leader Chuck Schumer, D-N.Y., blocked the Senate late Thursday from approving the short-term measure. “No poison pill riders,” he said. The bipartisan budget talks had progressed smoothly after the White House dropped a threat to withhold payments that help lower-income Americans pay their medical bills and Trump abandoned a demand for money for a border wall with Mexico. With neither party savoring a federal shutdown, it seemed likely Congress would approve the week-long stopgap measure in time to keep agencies open. On the separate health care bill, House Republican leaders are still scrounging for votes from their own rank-and-file to rescue it. “As soon as we have the votes, we’ll vote on it,” McCarthy said of health care legislation. Republicans have recast it to let states escape a requirement under President Barack Obama’s 2010 law that insurers charge healthy and seriously ill customers the same rates. They could also be exempted from Obama’s mandate that insurers cover a list of services like hospitalization and substance abuse treatment and from its prohibition against charging older customers more than triple their rates for younger ones. The overall legislation would cut the Medicaid program for the poor, eliminate Obama’s fines for people who don’t buy insurance and provide generally skimpier subsidies. Centrist Republicans were the primary target of lobbying by the White House and GOP leaders seeking the 216 votes they would need to clinch passage of the health measure. More than a dozen Republicans, mostly moderates, said they were opposing the legislation. Many others remained publicly uncommitted, putting party elders in a tough spot. If 22 Republicans defect, the bill would fail, assuming all Democrats opposed it. House Speaker Paul Ryan, R-Wis., wants to avoid an encore of last month’s embarrassment. He abruptly canceled a vote on a health care overhaul at that time because of opposition from moderates and conservatives alike. On Wednesday, conservatives in the House Freedom Caucus announced their support for the revised health legislation. That reversed the conservatives’ opposition to the earlier edition of the legislation. AP reporters Erica Werner, Andrew Taylor and Kevin Freking contributed to this report. Left: U.S. President Donald Trump speaks during an April 27 interview with Reuters in the Oval Office of the White House in Washington, U.S. Photo by Reuters/Carlos Barria.